Total peace and tranquility to be found at our boutique self-contained fully serviced B+B cottage. Underhill Cottage caters for two people looking for a peaceful vacation (there is a double sofa bed for additional guests if required however the cottage is more suited to a couple). Fresh flowers and home baking on arrival. Wake up to sunshine and bird song. Enjoy breakfast with our generous provisions for cooked and continental breakfast, home-made preserves, baking and farm fresh eggs! Eat breakfast or relax with a pre-dinner drink in our garden setting while watching native birds cavort in the trees. We are on the popular Remutaka Cycle Trail. Our property is surrounded by native trees and farmland. Feed our horses and chickens or the lambs in spring. Situated 1.4 km from SH2 (Underhill Road is a continuation of Wakefield Street) and approximately one-hour’s drive from Wellington Airport. 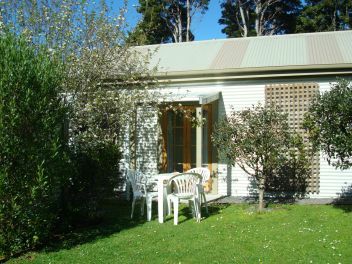 Within easy walking distance from Featherston Township, Wedding venues and Featherston railway station. A hop-off point for concert venues and the vineyards of Martinborough (tours can be arranged through us) or the Historic township of Greytown – both just 10 minutes drive away. A 40 minute drive takes you to Lake Ferry and their famous fish and chips and the coastal drive to Ngawi Fishing Village and Cape Palliser Light house.